When only the best turkey burgers will do, reach for the mouthwatering flavor of Rastelli turkey craft burgers! Made from all-natural turkey breast meat, these tasty turkey burgers can go straight from the freezer to the grill, pan, or oven whenever a craving strikes. Top them with all your favorite burger fixin’s, wrap them in a lettuce leaf to cut carbs, or add one to a salad to make it a satisfying meal. With each protein-packed, delicious turkey burger weighing in at a generous 5 oz. and just 237 calories, you can tempt your taste buds and stay nutritionally on track. At Rastelli Market, we never compromise on quality or flavor, and we believe ours to be the best frozen turkey burgers money can buy. An alternative to our also-delicious beef craft burgers, our turkey burgers are just as satisfying but lower in fat. Available in packs of 6, 10, 12, 15 or 30, we always keep at least a few on-hand at home for a quick, delicious dinner or lunch that gets a thumbs-up from adults and kids alike – even the pickiest eaters in the family! Can’t make it to one of our stores? Not a problem! 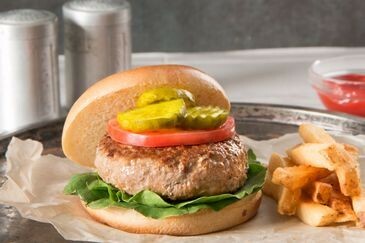 Now you can buy the best turkey burgers online right here at RastelliMarket.com.